A centuries-old bet with Queen Elizabeth shows that you just need to use the right scale. So what’s the value of music? Let’s take one possibility off the table: it’s not “zero,” because, as we know, there’s demand. I mean, the value of air is not zero, plentiful as it still is — it’s legally protected, and if you still insist that it has no inherent value, well, just have it taken from you. See? Value. Are there similar analogies that can be instructive within the streaming music space? Well, yes. 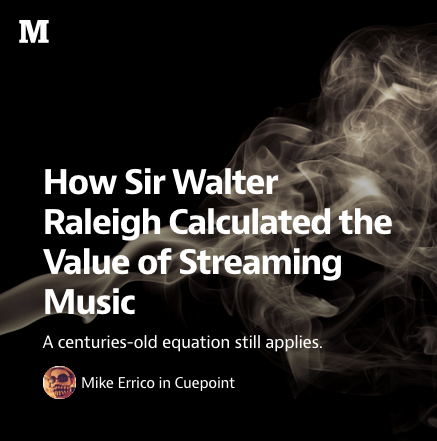 Check out “How Sir Walter Raleigh Calculated the Value of Streaming Music,” my latest piece on Cuepoint.